Reference number for this case: 14-Oct-54-Battenheim. Thank you for including this reference number in any correspondence with me regarding this case. The regional newspaper L'Alsace for October 15, 1954, reported that on October 14, 1954, at 06:10 p.m., an industry executive from Mulhouse was returning from Colmar with his wife and child, being near Battenheim and approaching the Ile Napoléon. The occupants of the vehicle then saw for two seconds right in fron of them in the sky, going on towards Basel, an elongated body which emitted a bright green light with a vaporous trail. The driver thought it was impossible that it was a plane, and that it was maybe "flying cigar". He noticed that the driver of a truck that was ahead of his car on the road must have seen it too becaused he slowed down as if he wanted to better watch what was happening in the sky, before accelerating again. This is the question that arose last night during the two seconds exactly that the phenomenon that took place under their eyes lasted, an industry executive from Mulhouse returning from Colmar with his wife and child on the road to Battenheim. It was 6:10. The vehicle approached the Ile Napoleon when the occupants saw passing in the sky right in front of them and disappear in the direction of Basel, an elongated body, which emitted a bright green light with a vaporous trail. The phenomenon also seemed to have been seen by the driver of a truck that preceded the industry executive's car. The latter saw him indeed slow down, as if to follow what was happening in the heavens, before accelerating the truck again. Anyway, the "saucers" chapter and other unidentifiable objects is not ready to be closed this year. They had seen, rishing straight line in the sky and disappearing in the direction of Switzerland, an elongated object, emitting a bright light. The appearance lasted about two seconds. "I first thought of a plane crashing down to the ground. But how to reconcile this hypothesis with the light and the green trail? No reflection by clouds was possible.The sky was already dark, but where the stars were not yet visible, was in fact entirely clear..."
"Battenheim - 68 - at about 6 p.m.: investigation. Vivid luminous phenomenon." 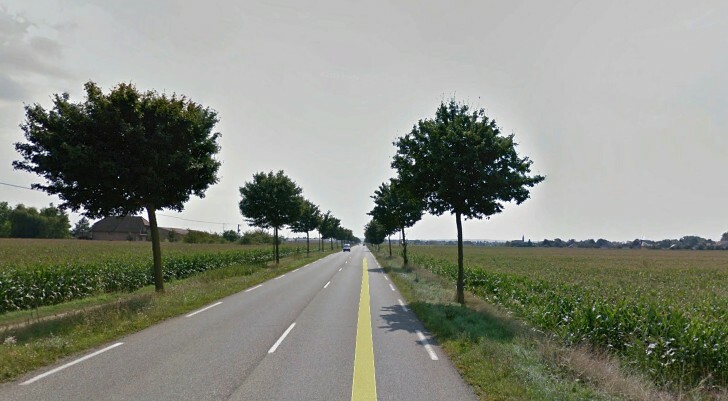 The road after Battenheim and before the l'Ile Napoléon, in 2014. The witnesses saw the object right in front of them as they were are on the road from Colmar to Mulhouse after Battenheim and before Ile Napoléon, due South. The object went towards the direction of Basel, so to their East. We can deduce that the visual direction of motion of the object was West to East. Obviously from the date, hour, direction, brevity, description, these people saw the meteor of 06:15 p.m. that day; which was widely observed and often mistaken for a "flying saucer" or a "flying cigar." [la1] "Un cigare volant? ", article in the regional newspaper L’Alsace, France, October 15, 1954. [la2] "Cigars, saucers... and pots", article in the regional newspaper L’Alsace, France, October 16, 1954. 3.0 Patrick Gross April 26, 2014 Additions [la1], [la2], [cv2], Summary, Explanations; which were "Not looked for yet. The meteor of 06:10 p.m. that day" previously.